2 Data 1. To identify problems to work on. 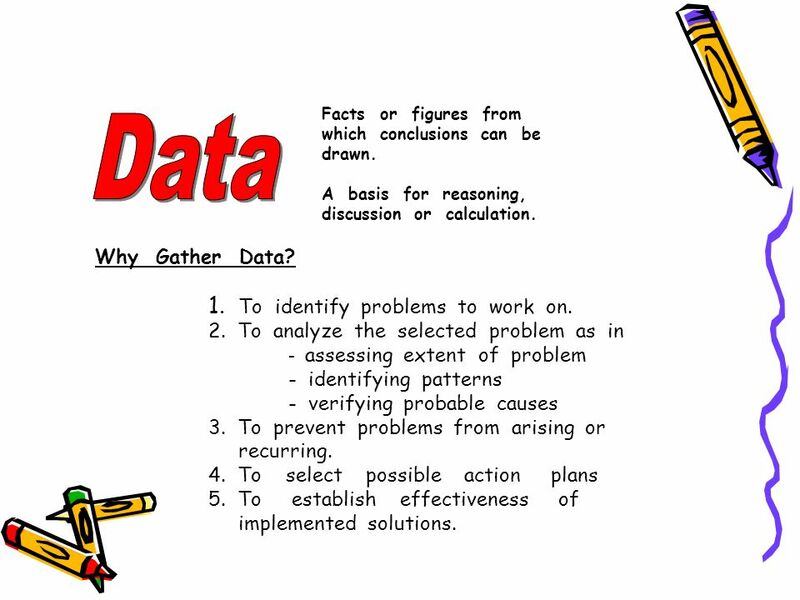 Why Gather Data? Facts or figures from which conclusions can be drawn. A basis for reasoning, discussion or calculation. 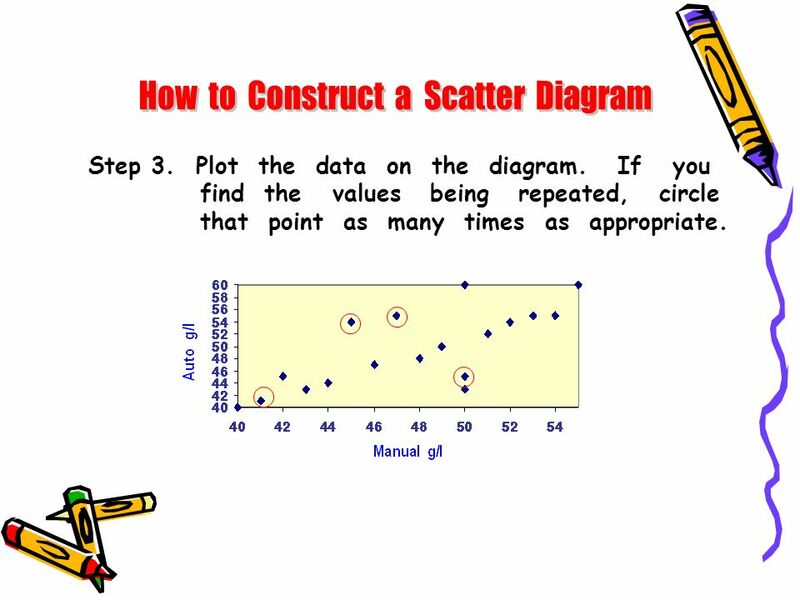 Data Why Gather Data? 1. To identify problems to work on. 2. 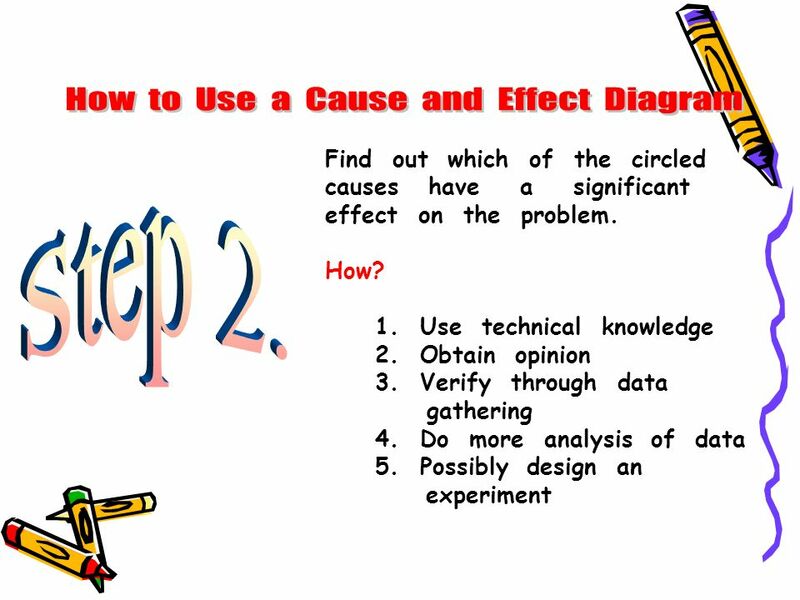 To analyze the selected problem as in - assessing extent of problem - identifying patterns - verifying probable causes 3. To prevent problems from arising or recurring. 4. 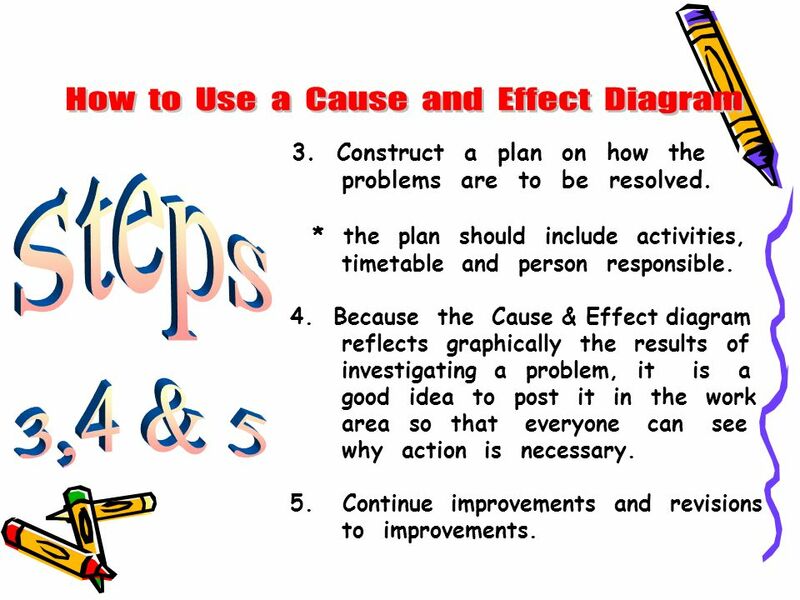 To select possible action plans 5. To establish effectiveness of implemented solutions. vertical graphs which helps us to determine which problems to solve in what order. 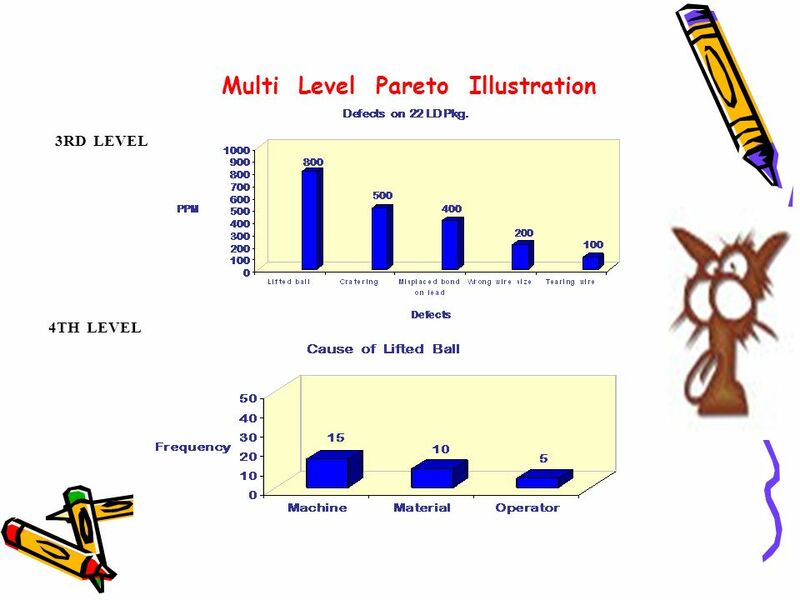 Doing a Pareto diagram based upon check sheets or other forms of data collection helps us direct our attention and efforts to truly important problems. 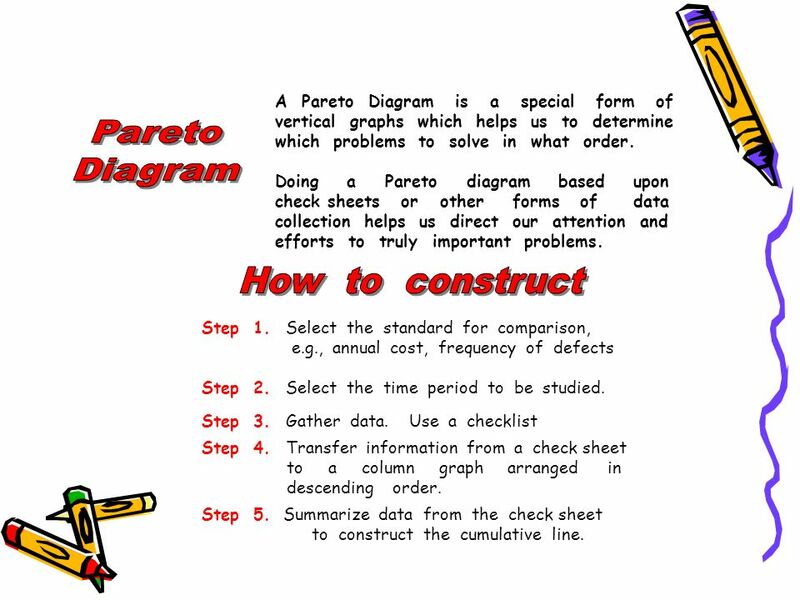 Pareto Diagram How to construct Step 1. 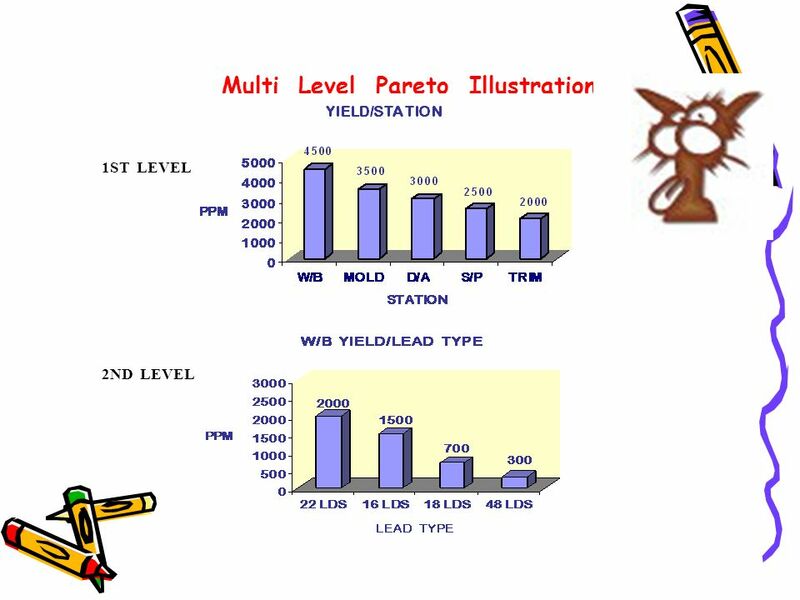 Select the standard for comparison, e.g., annual cost, frequency of defects Step 2. Select the time period to be studied. Step 3. Gather data. Use a checklist Step 4. 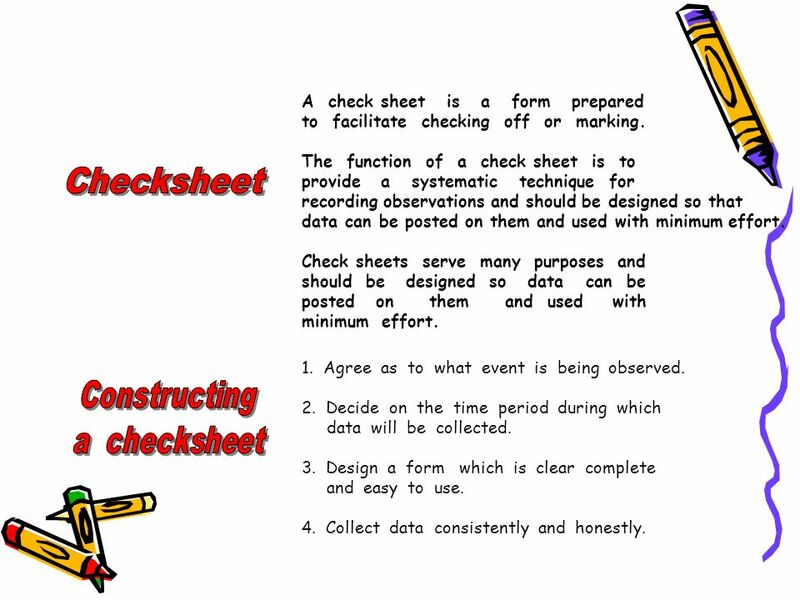 Transfer information from a check sheet to a column graph arranged in descending order. Step 5. 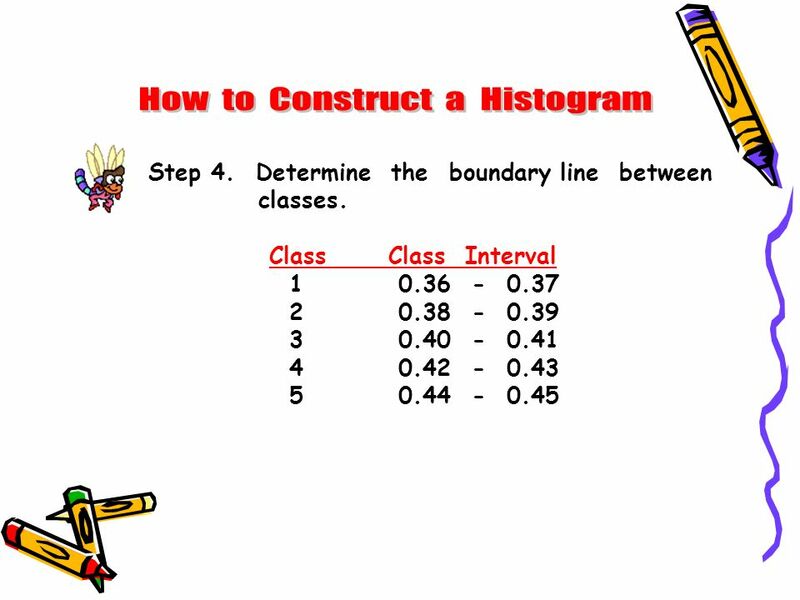 Summarize data from the check sheet to construct the cumulative line. 5 Different Uses 1. 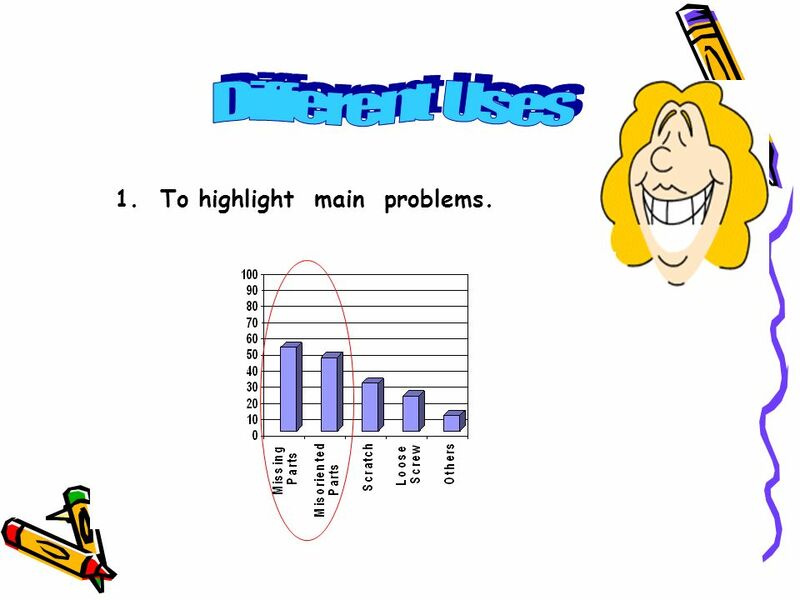 To highlight main problems. 11 Different Uses 4. 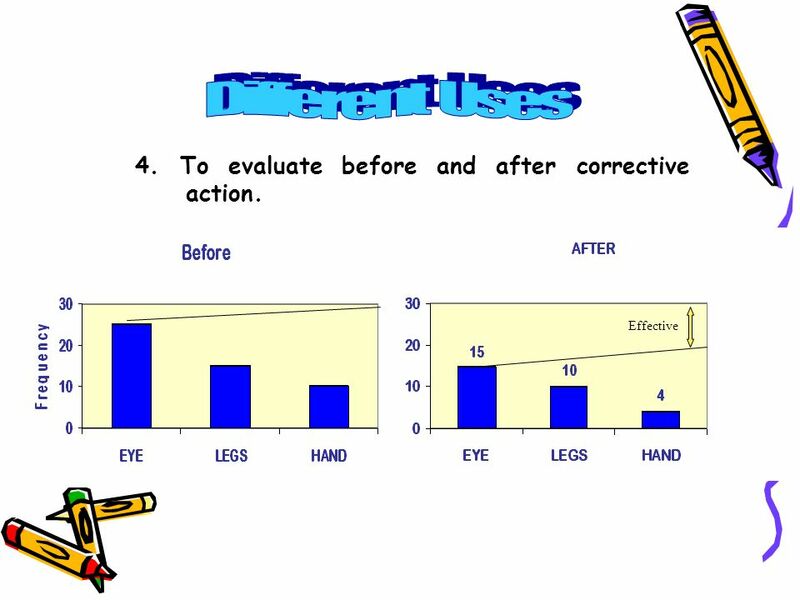 To evaluate before and after corrective action. 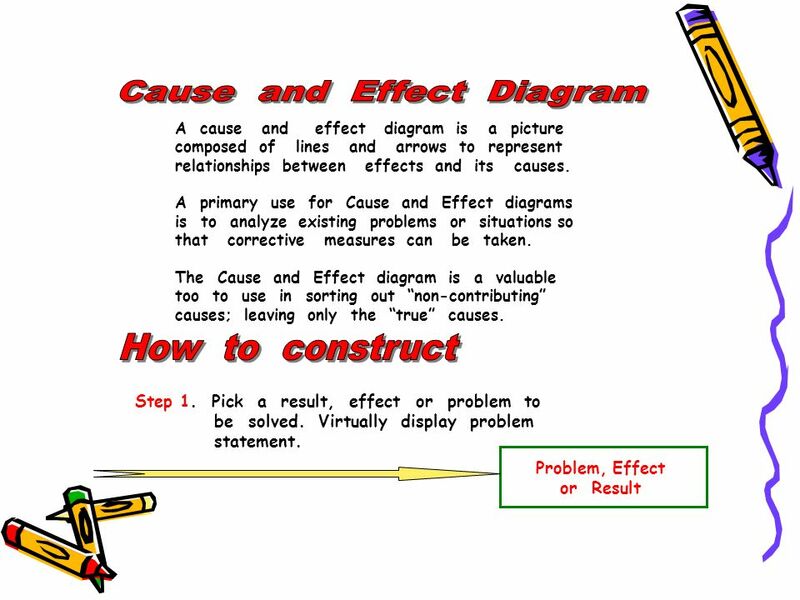 How to Construct a Cause & Effect Diagram Step 2. 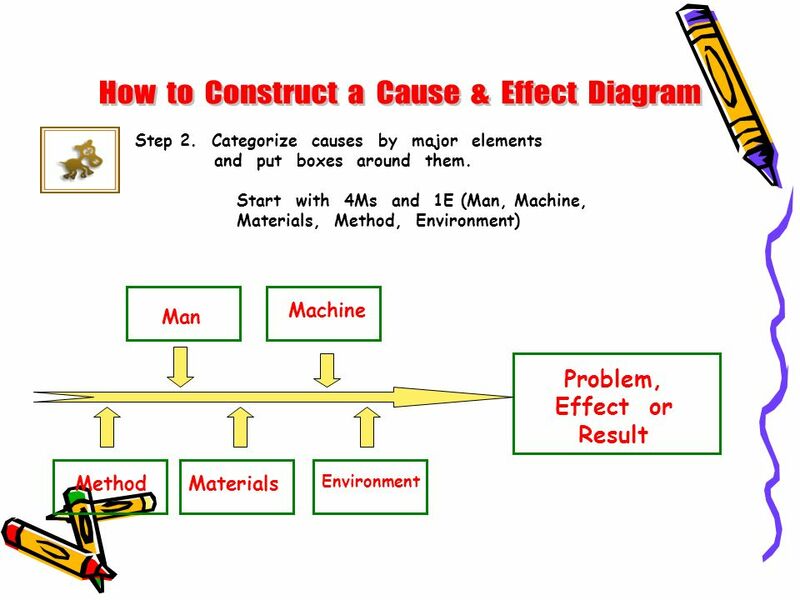 Add smaller branches to main causes and continue adding until all possible causes are exhausted. 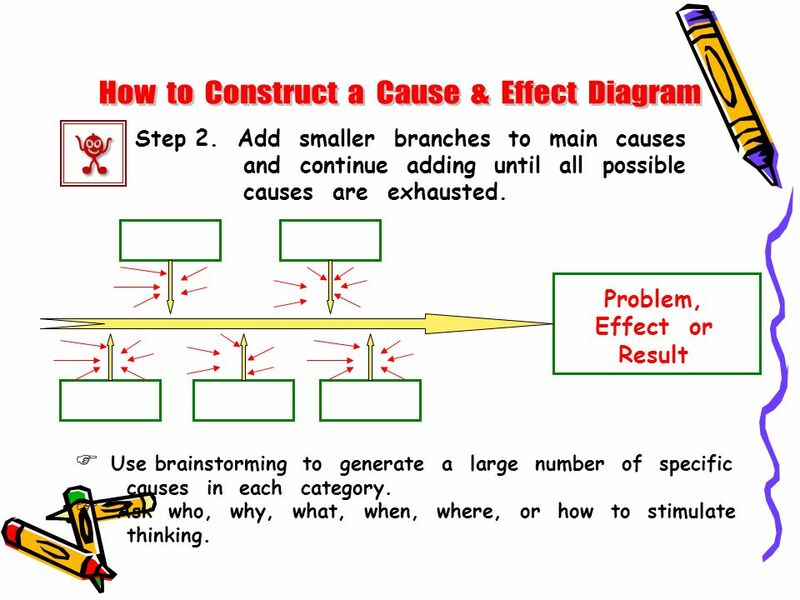 Problem, Effect or Result Use brainstorming to generate a large number of specific causes in each category. Ask who, why, what, when, where, or how to stimulate thinking. 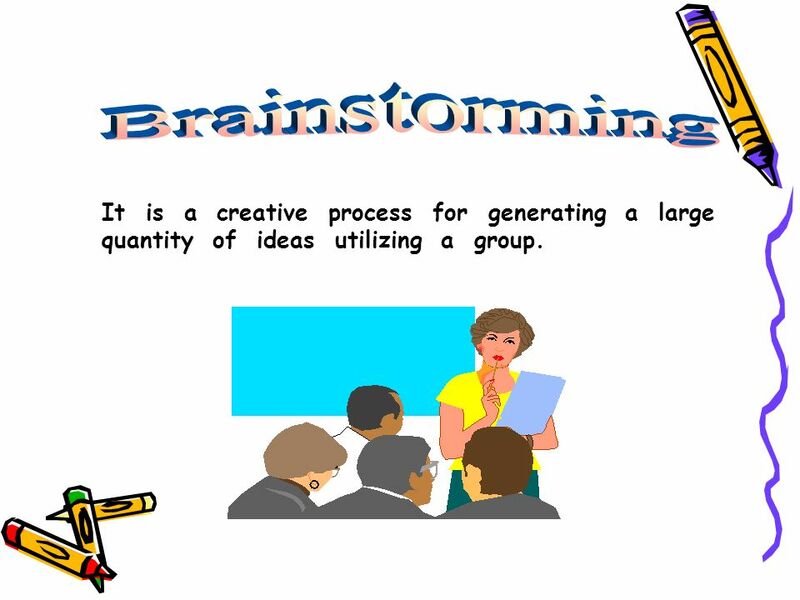 quantity of ideas utilizing a group. Step 1. Compare all causes (What is) against operational standard (What should be). 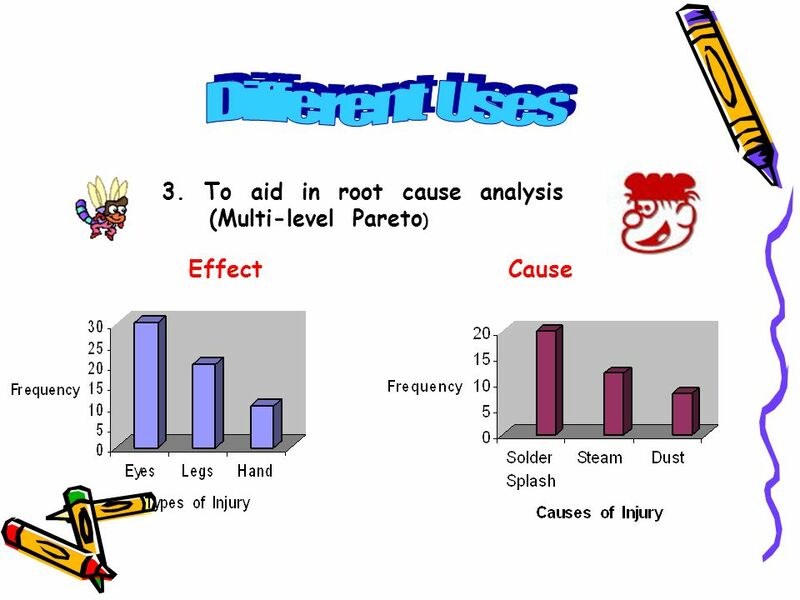 Circle the causes for causing “bad” effect. 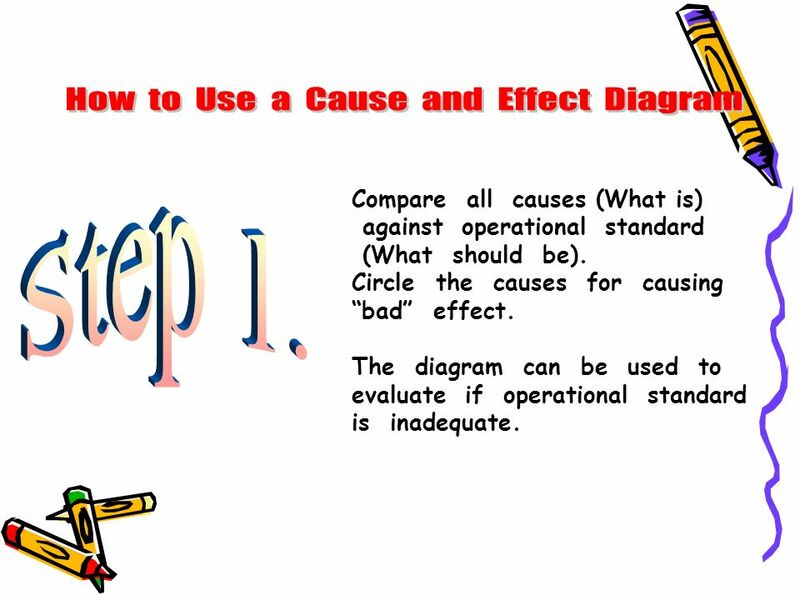 The diagram can be used to evaluate if operational standard is inadequate. Find out which of the circled causes have a significant effect on the problem. How? 1. Use technical knowledge 2. Obtain opinion 3. Verify through data gathering 4. Do more analysis of data 5. Possibly design an experiment Step 2.
the frequency of occurrence in a number of related measurements. 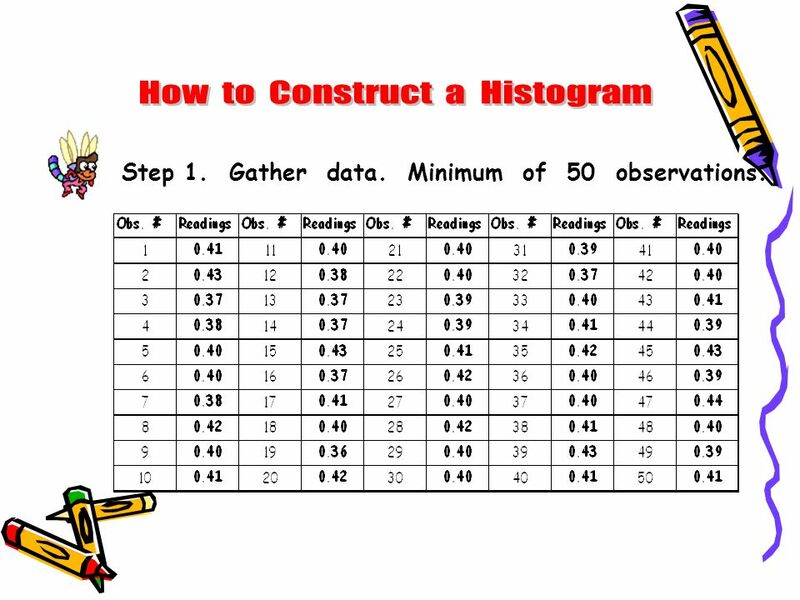 A histogram reveals how measurements vary from one another and displays the distribution of data. 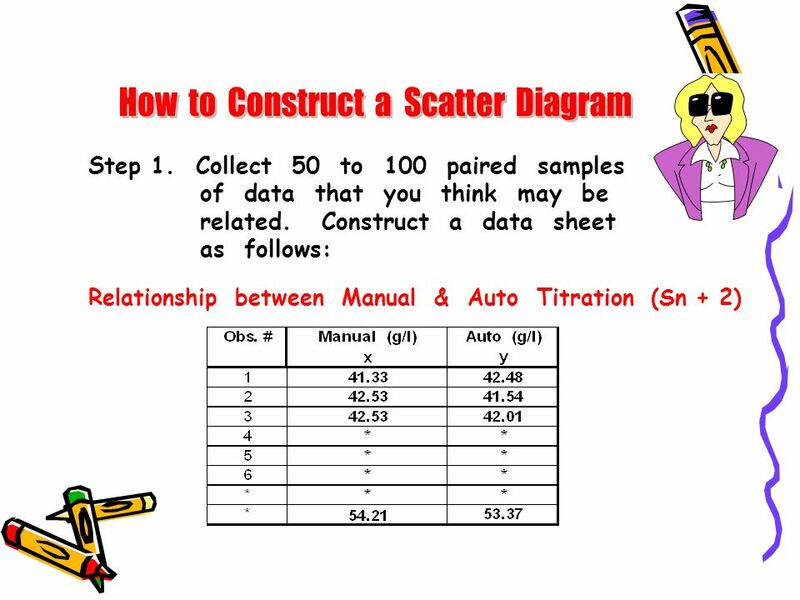 It can be used to compare sample results with specification. Step 1. Gather data. Minimum of 50 observations. Step 3. 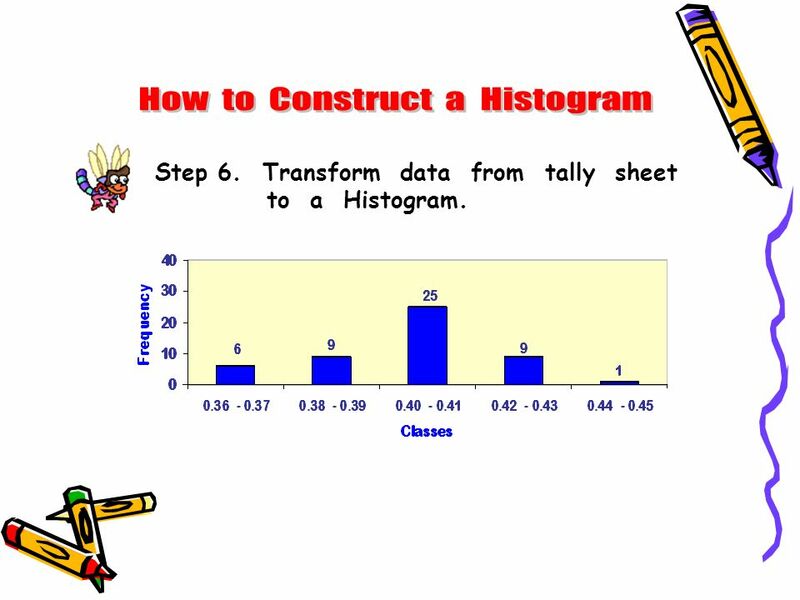 Determine how many classes are required to make a histogram. Compute for the class interval. 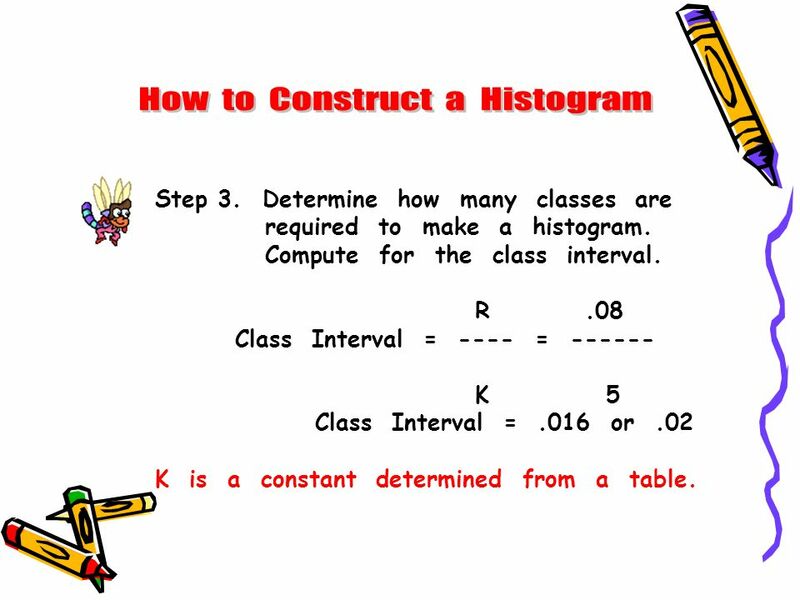 R Class Interval = = K Class Interval = or .02 K is a constant determined from a table. Step 6. 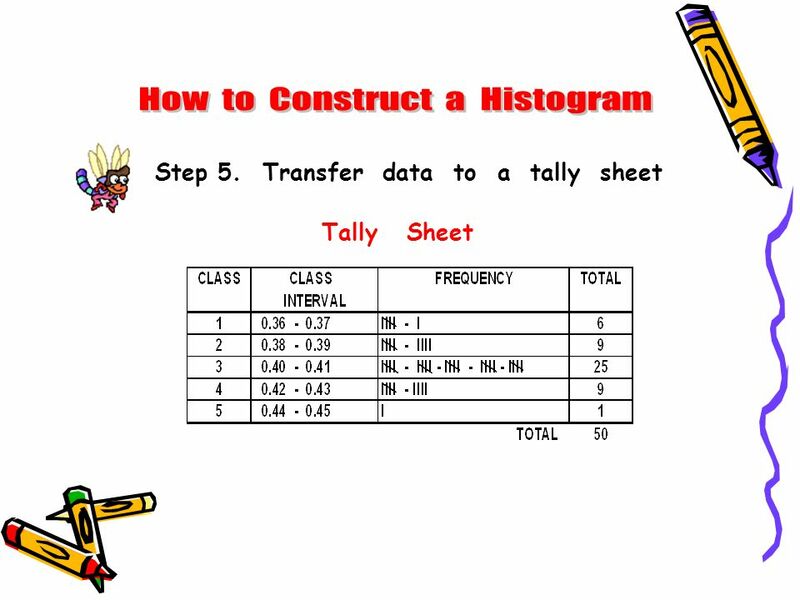 Transform data from tally sheet to a Histogram. possible relationships between one variable and another. 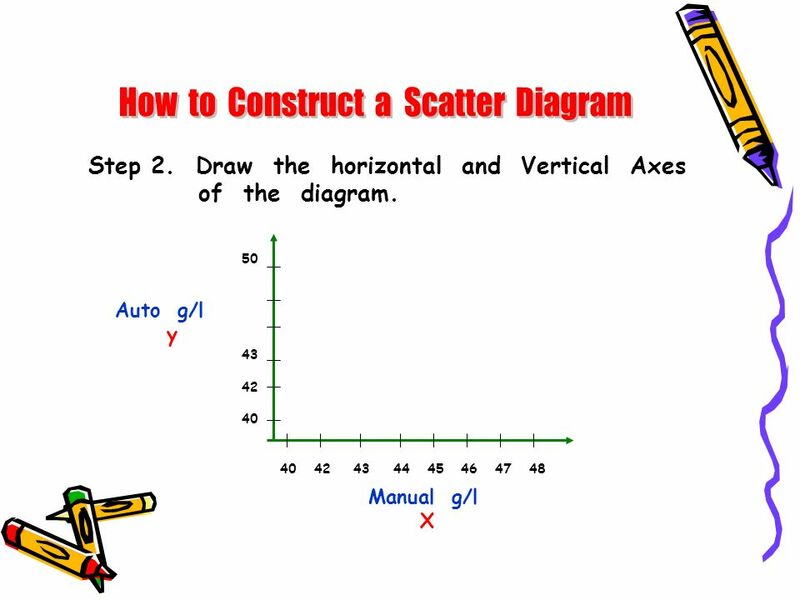 The Scatter Diagram is used to test for possible cause and effect relationships. 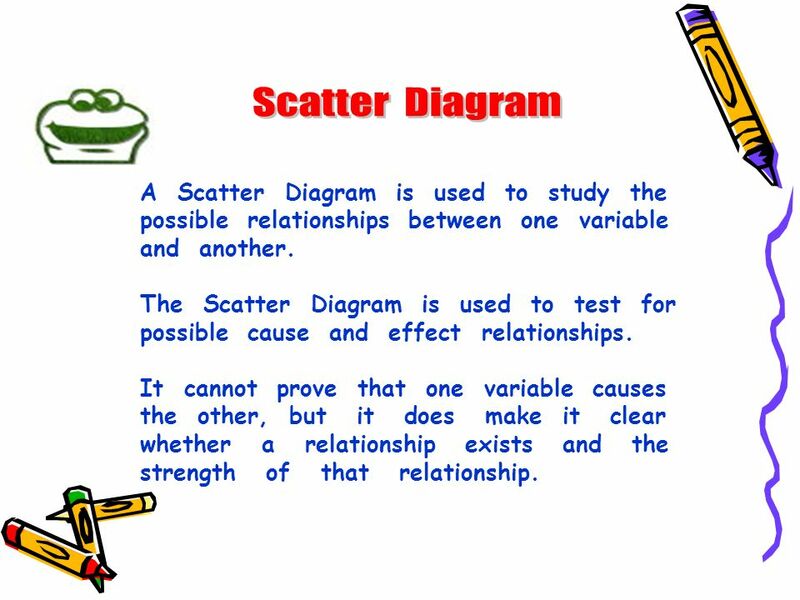 It cannot prove that one variable causes the other, but it does make it clear whether a relationship exists and the strength of that relationship. Step 3. 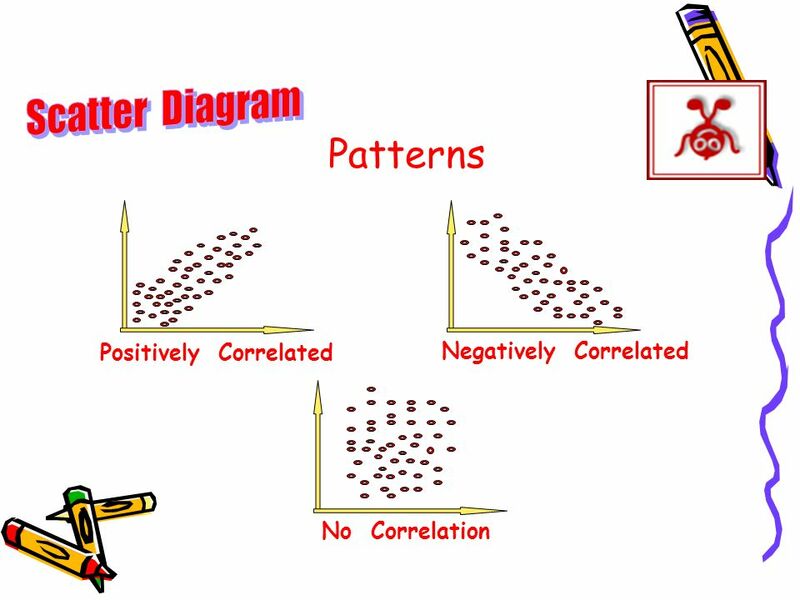 Plot the data on the diagram. If you find the values being repeated, circle that point as many times as appropriate. 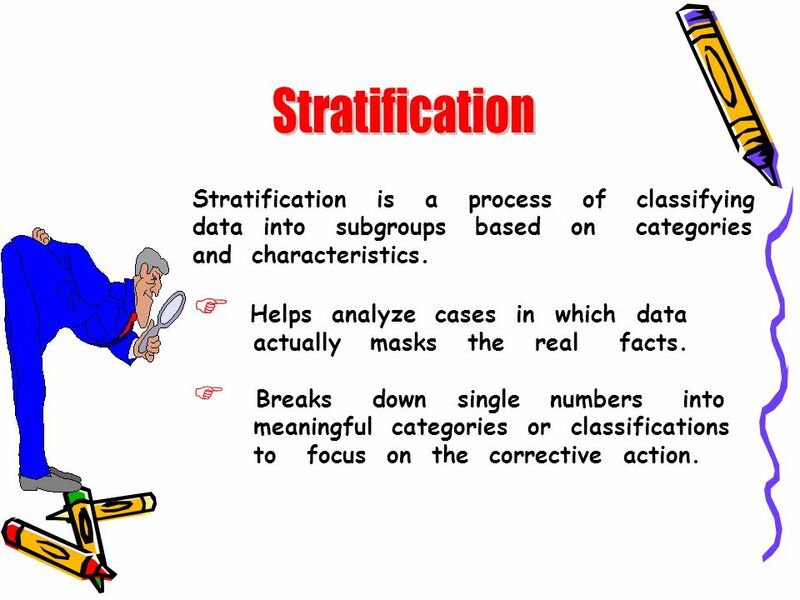 Stratification is a process of classifying data into subgroups based on categories and characteristics. Helps analyze cases in which data actually masks the real facts. Breaks down single numbers into meaningful categories or classifications to focus on the corrective action. 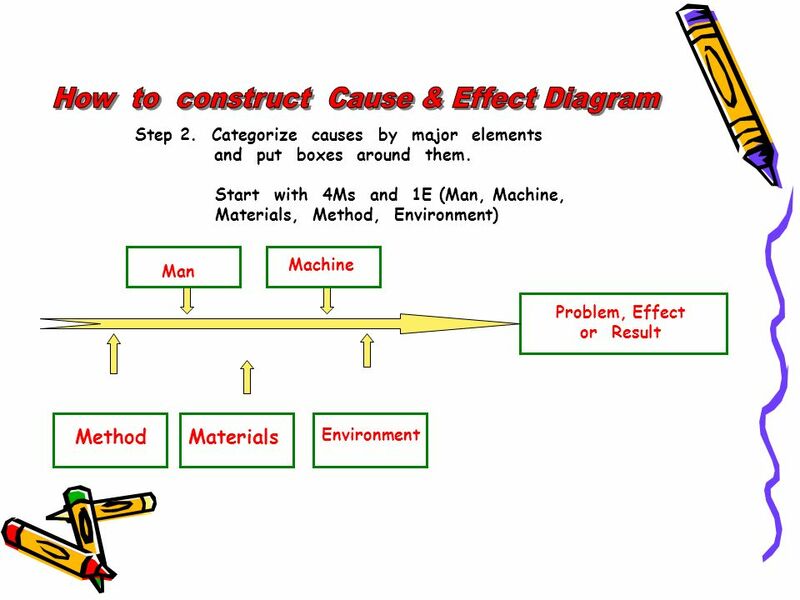 sheets, create checklist, scatter diagram and cause and effect diagram. 2. 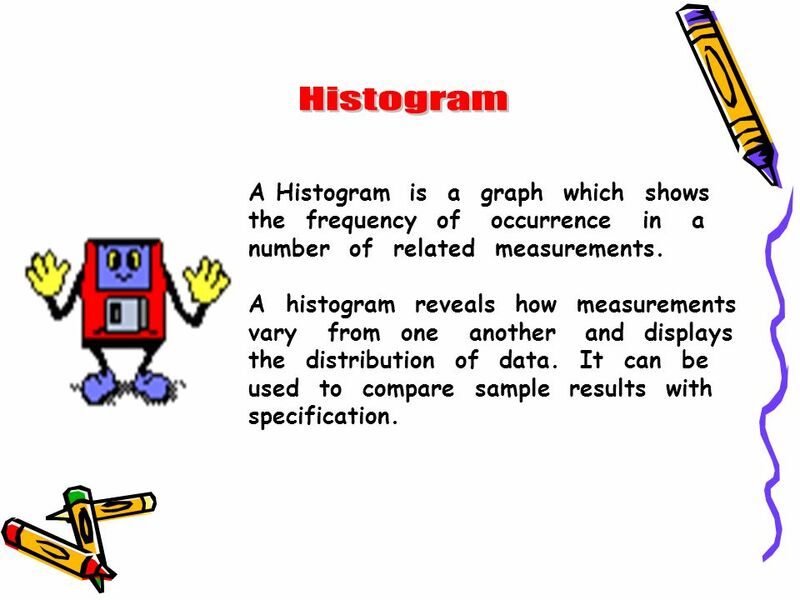 During data analysis when using histograms, pareto charts, scatter diagrams and cause and effect analysis. Stratification break down single numbers into meaningful categories or classifications to focus on corrective action. a process. Sample averages are plotted on the chart. 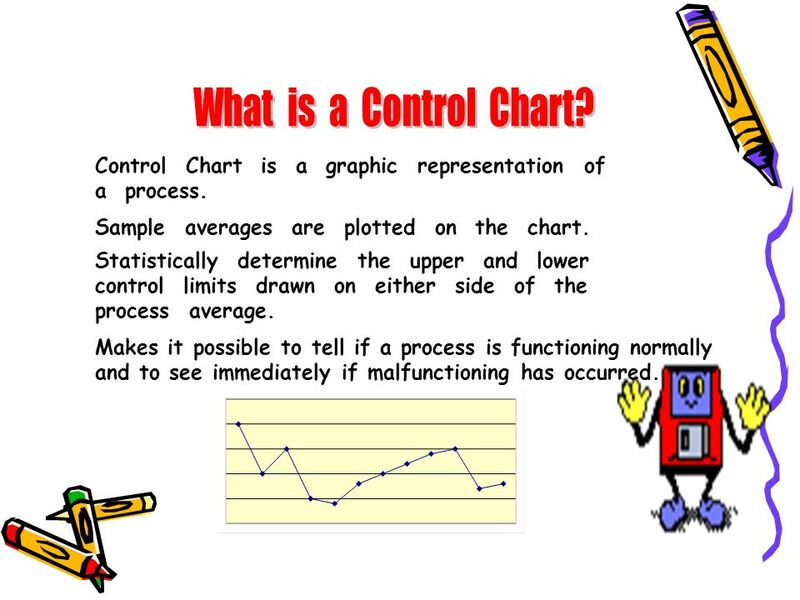 Statistically determine the upper and lower control limits drawn on either side of the process average. Makes it possible to tell if a process is functioning normally and to see immediately if malfunctioning has occurred. 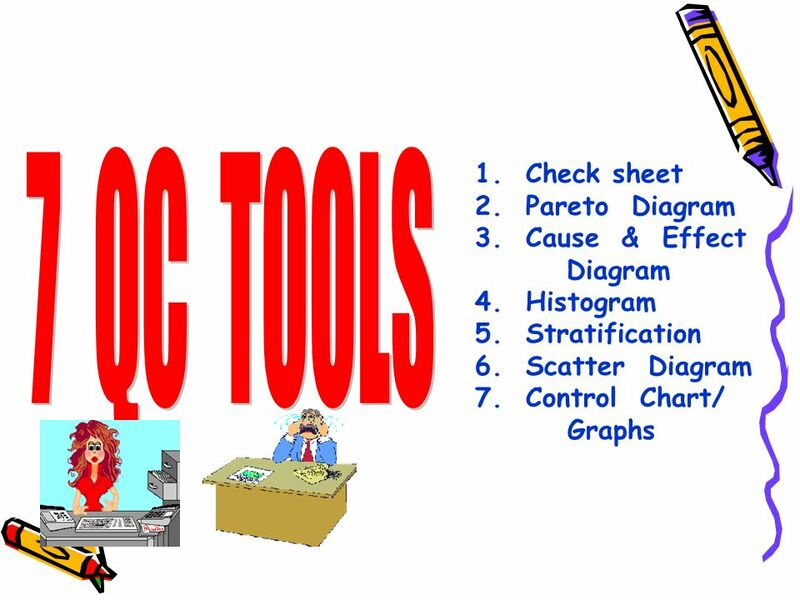 Download ppt "7 QC TOOLS 1. Check sheet 2. 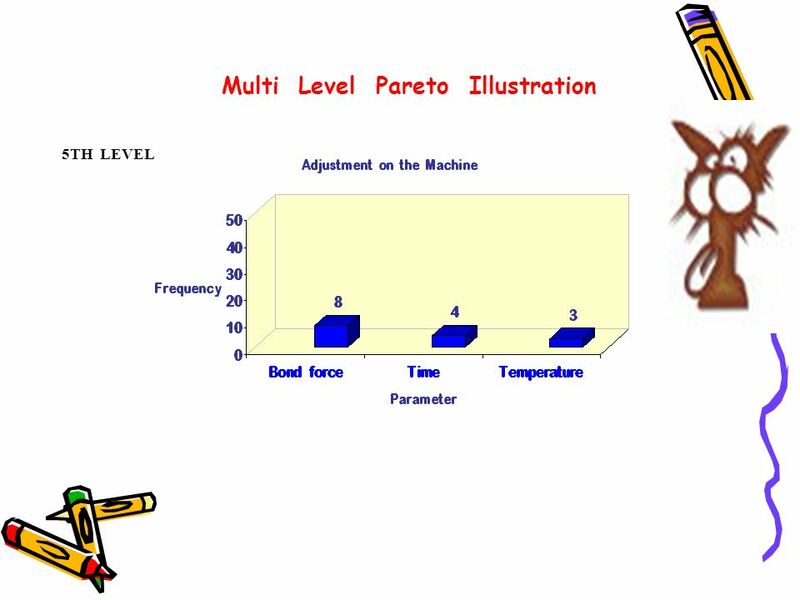 Pareto Diagram 3. Cause & Effect Diagram"
Frequency Distributions Quantitative Methods in HPELS 440:210. 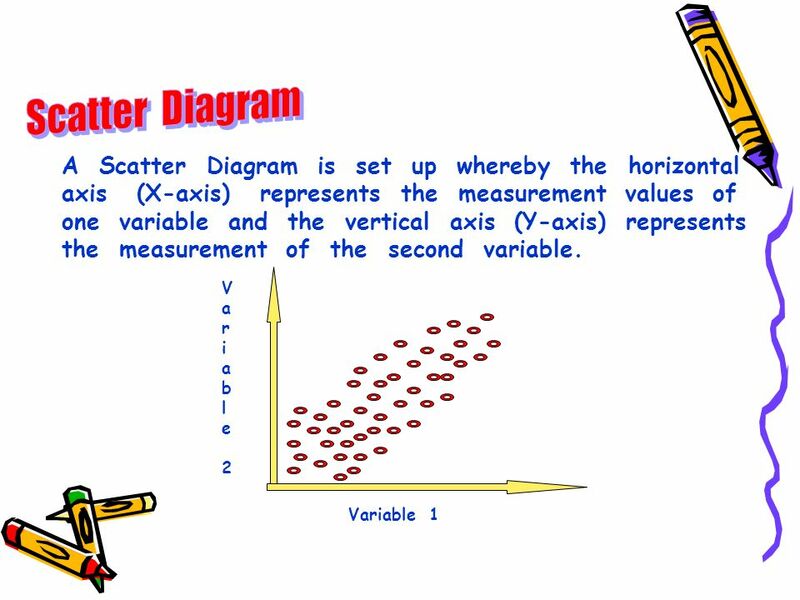 Frequency Distributions & Graphs Chapter 2. 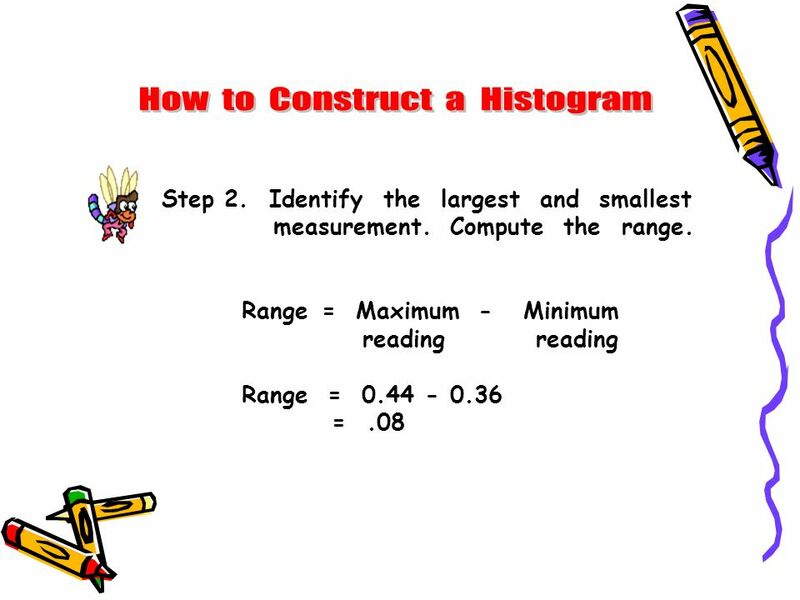 Outline 2-1 Introduction 2-2 Organizing Data 2-3 Histograms, Frequency Polygons, and Ogives 2-4 Other Types. Copyright © 2010, 2007, 2004 Pearson Education, Inc. All Rights Reserved. Lecture Slides Elementary Statistics Eleventh Edition and the Triola. Slide 1 Spring, 2005 by Dr. Lianfen Qian Lecture 2 Describing and Visualizing Data 2-1 Overview 2-2 Frequency Distributions 2-3 Visualizing Data. Slide Slide 1 Copyright © 2007 Pearson Education, Inc Publishing as Pearson Addison-Wesley. 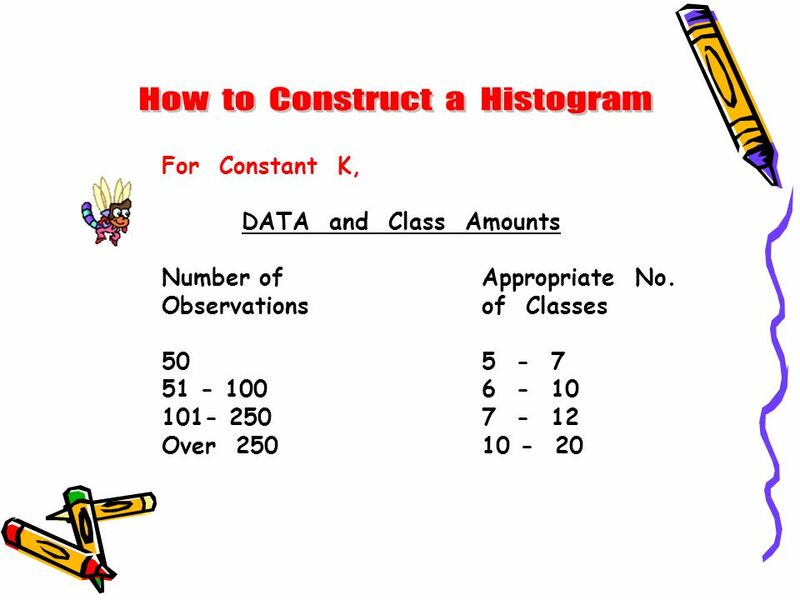 Lecture Slides Elementary Statistics Tenth Edition and the. The controlled assessment is worth 25% of the GCSE The project has three stages; 1. Planning 2. Collecting, processing and representing data 3. Interpreting. Tumolo’s Toolbox 7 Step Improvement Process. 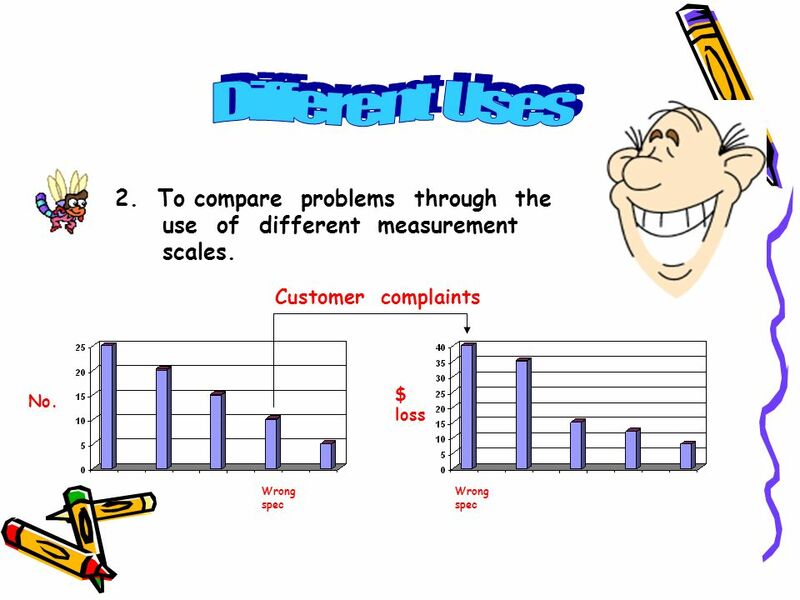 Total Quality Management BUS 3 – 142 Statistics for Variables Week of Mar 14, 2011.